$12.50 with shipping. CD's mailed out with 48 hours of receiving request & paypal's confirmation of payment. Dr. Jazz brings a wide variety of musical influences into its basic groove of funky, contemporary New Orleans street music, including rhythm and blues, swing, Latin, Dixie, pop and reggae. The group has a 20 year history of being one of the busiest and hottest bands in Ottawa, eastern Ontario, and western Quebec. We have performed for the Jazz and Blues festivals, conventions, corporate promotions, special events, dances, private parties, weddings and parades. We have been very active on the club scene. 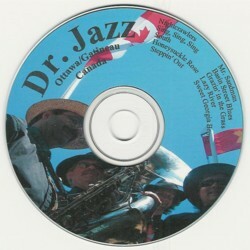 Led by reedman Dave Renaud, Dr. Jazz features Art Katona on trombone, Paul Cheatley on Banjo and guitar, and Bob Langley on sousaphone and string bass. The band has an exciting combination of sounds and does lots of vocals. Audiences of all ages find the group's groove infectious and danceable. Clients are impressed by the bands flexibility and diversity in numerous live music settings.